Game 28 Round 04: Hello there! Hello! 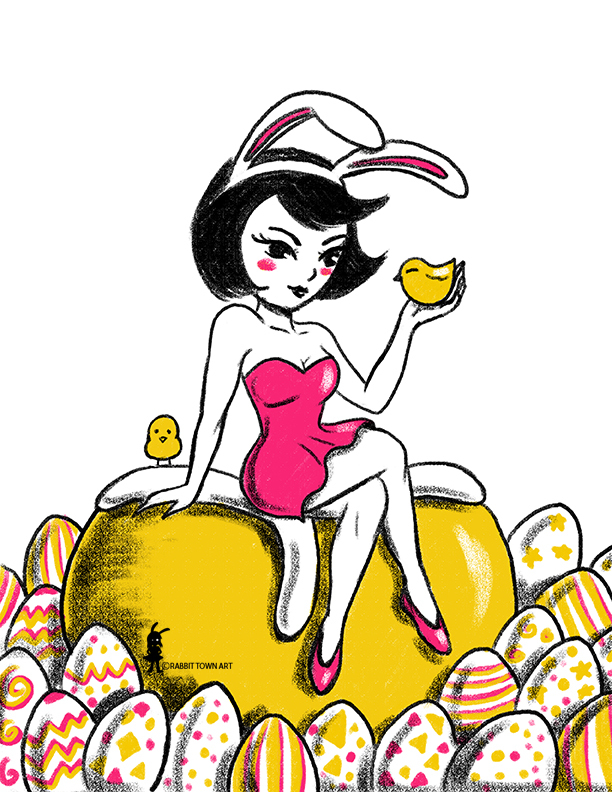 Today is the last day of the Easter Break and we had a few Easter items for Kookyrabbit. I don't do a lot of pin ups but I do find them enjoyable! That said, it hasn't been much of a break. Been doing a lot of work but it has been good! I got a lot done and have managed to have some drawing time for myself too. The working day is not over for me yet though. I have a few more things I need to design or animate before I can call it quits for tonight. That's what happens when you take more than one gig. Maybe I will take a breather after this is all done. I haven't had a chance to fish for more new jobs so it might happen anyway. Eek! I do love working and freelancing but I am coming to a point where I realize that I need to start making a push towards my end goal. Artists don't really retire unless they have to and I would rather not end up in that category...however..we all get old. That's just a fact or we die before we can get to that stage. I would like to be able to sell my own work autonomously through websites and galleries as well as doing more paintings and private commissions in the future. I haven't done a whole lot in that front and I would like to but I admit, it's not something I am positive I can succeed in. I would like to try though! I just can't stomach turning down well paid and interesting projects as of yet and I know that at some point, to work towards another goal I might just have to bite the bullet. Or work myself to the ground. Either, or. Game 27 Round 07: Off to School! Game 27 Round 05: What Happened? Game 27 Tound 03: Flower for you? Game 26 Round 08: Color Me Pink! Game 26 Round 04: Jelly Hug! Game 25 Round 07: Margarita Time!